Perhaps the most incredible adventure in the entire Riviera Maya! 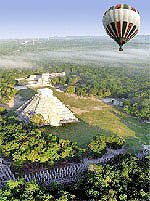 Flying in a hot air balloon, sailing silently over the famed Chichen Itza Mayan Ruins. Can you imagine?!? After landing, we'll participate in the traditional landing ceremony, with a champagne toast. We'll make our way next to the Chichen Itza Archaeological Zone, where you'll be treated to the mysteries and magic of the Mayan civilization on a fascinating guided tour of the ruins site. Next stop is Yaxunah, where we'll cool off with a swim in Lol Ha cenote, a legendary well of the Mayas. Take a guided tour of the Yaxunah ruins site, followed by a delicious buffet lunch. A truly incredible look into the past, what an adventure! Itinerary: Daily. Exact pickup time is determined at the time of reservation, and depends on the time of year. Plan on getting up early, though. Kids: Must be at least 4 feet (120 cm) tall, regardless of age.